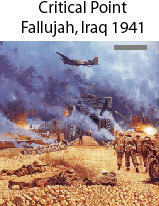 With Baghdad the target and the road network limited, the easiest and most practicable plan was to seize the Iron Bridge over the Euphrates River at Fallujah. An elaborate plan was created and carried out without a loss. Iraqi resistance was non-existent. With the town in British hands, the attacking force was dispersed elsewhere. The British did not think the Iraqis would counterattack. On May 22, in the early morning, the Iraqi 6th Brigade 3rd Division (800 men) with CV33 tankettes attacked. Iraqi artillery pulverized the two British companies holding the town in their trenches surrounding it. They were forced to pull back into the town. The three Iraqi battalions with tanks were as good as the British by accounts in combat but for one thing: steady morale. From 3 a.m. to 10 a.m., the two British companies held but were nearing their end in this urban type combat. Luckily, the Luftwaffe had failed to support this attack (although they did the following day!). At 10 a.m., the tables began to turn when two additional British companies arrived. The battle did not stop but raged onward until the Iraqis gave up at 6 p.m. The road to Baghdad was now open. It had been a near thing! 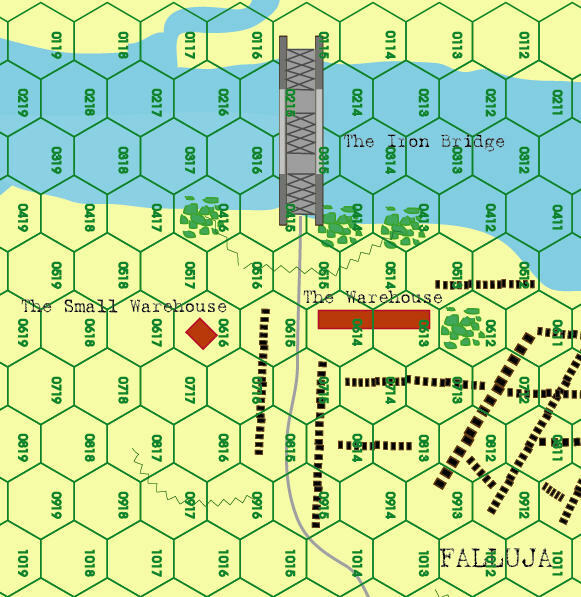 One 11x17 inch map, 160 counters, company/platoon, each hex is 100 yds., each turn is 1.5 hours for a total of 11 turns. Playing aids include Game Turn record, numerous charts and tables.Each aircraft or tank is one of that type.